The village of Warcoing is located north of the town of Tournai off the N50. From the motorway E17 turn off at junction 2, Kortrijk Zuid, onto the N50 direction Tournai. Follow the N50 to the sign to Warcoing, turn right into Rue Des Tilleuils and follow this road into the village. At the crossroads go straight over and the church is on the right. 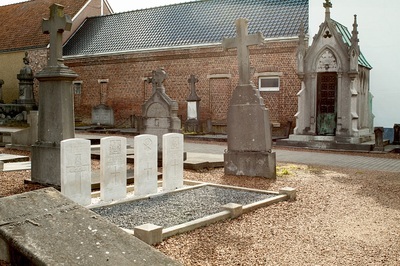 The graves are located to the right inside the entrance. 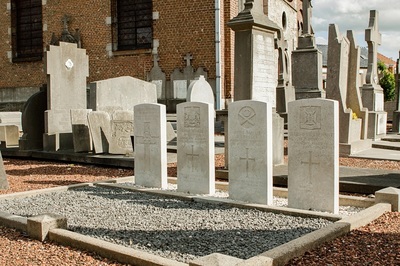 Warcoing Churchyard contains four Commonwealth burials of the First World War, all dating from October 1918 and the Advance to Victory. 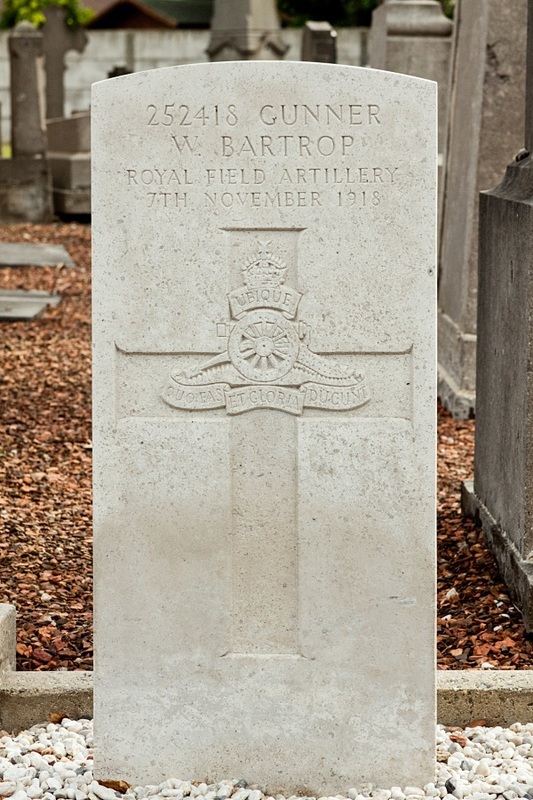 252418 Gunner Wilfred Bartrop, "X" 40th Trench Mortar Battery, Royal Field Artillery, died 7th November 1918. Husband of Ruby Bartrop, of 12, Allen St., Worksop. Notts. 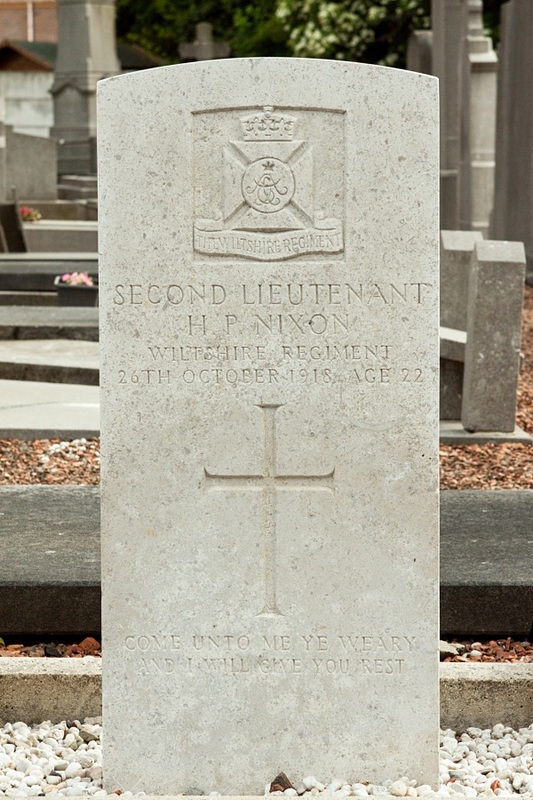 Second Lieutenant Harold Perceval Nixon, 6th (Wiltshire Yeomanry) Bn. Wiltshire Regiment, died 26th October 1918, aged 22. Son of Alexander and Annie Nixon, of 12, Hopefield Avenue, Belfast. 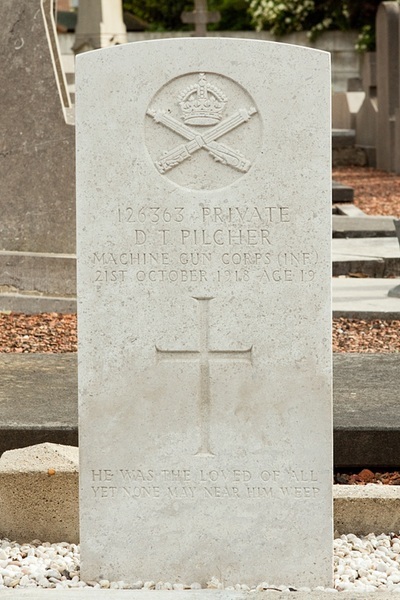 126363 Private D. T. Pilcher, 31st Bn. Machine Gun Corps (Infantry), died 21st October 1918, aged 19. Son of Henry Richard and Elizabeth Woolgar Pilcher, of 8, Greenfield Rd., Folkestone. 64507 Private H. Stanton, 16th Bn. Manchester Regiment, died 22nd October 1918, aged 19. 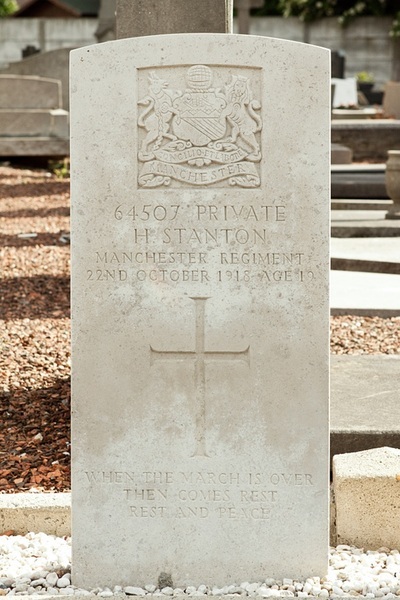 Son of Albert and Rose Stanton, of 45, Windsor Rd., Stirchley, Birmingham. Born at Selly Park, Birmingham.